Most of the books I owned for a long time have been donated to the library. Same with dvd's / movies. I am an avid rare book collector, especially books on Buddhism and spirituality. Nothing in this world beats the scent of an old book. The craft of a perfect leather binding. The feel of grams of quality paper in every sepia page. And the spiritual karmic bonding I feel with all the hands that touched that book before it got to my own hands. I always carry with me an 1881 volume which contains Max Müller's Dhammapada and Fausböll's Sutta Nipata, F.L. 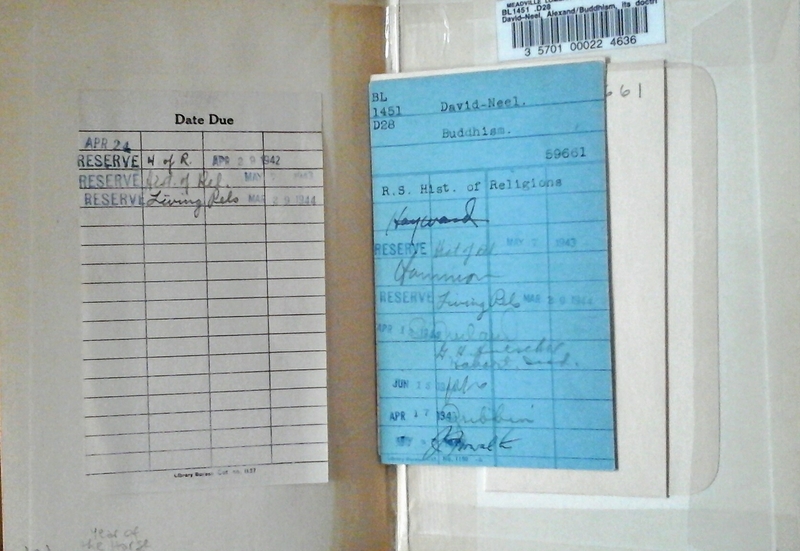 Woodward's 1925 "Some Sayings of the Buddha," Nyanatiloka Thero's 1915 "The Word of the Buddha" and a 1911 book on haiku. We are talking 3 to 5 kg weight in books. Kindles feel cold to me. One of my favourite books is Alexandra David Neel's "Buddhism: its doctrines and its methods." The volume I have is the 1939 first edition, and used to belong in a library. People still read and carried on with their lives throughout the blitz of WWII. And something of those lives remains in my books. And I can hold them in my hands. Me too. Welcome to the techno side of The Force. Whatever form we find knowledge or attune to dharma study, the more likely we are to jump from ignorance to Ah-ha! 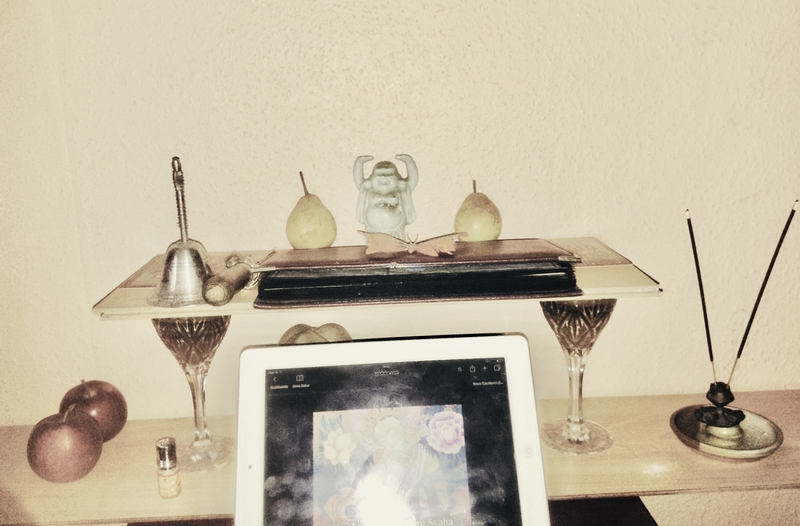 I would love to have a Kindle on my shrine. I read on my Ipad which doubles up as a shrine/good companion ... along with pears of apples to feed the Bodhi (I get the left-overs). Kindle or real books? Have both! I have both, some books I need in "real" form and some I find much more helpful in Kindle form (I love being able to highlight stuff and find it without flipping through the entire book over and over again). I love being able to get e-books from the library without having to deal with going there all the time (we live out of town). Otherwise, we simply have limited space, and as much as I read continuing to buy books in physical form was becoming a headache. I had books on every shelf in the house, piled in corners, stuffed in boxes. They weren't doing anyone else any good. I donated a bunch to a man who ships books to military members overseas and gets them to safe houses and similar places. And another pile to the local used book store. I think I kept about 50 out of hundreds of books - the ones I re-read or refer to often or are part of collections and some very old books I'll never read because they are completely written in Finnish, lol, but came with my great-grandma 100+ years ago when she immigrated. I got my kindle fire for $29 in July. It's my 3rd one! However, if you like to read outside and can swing the price, I'd get a Paperwhite. Unless you truly need the tablet portion. I have never used my fire as a tablet, actually. But reading outside is almost impossible. When it comes to sales the next month or so, it's pretty rare they run out, and even if they do they usually let you purchase at the sale price for later delivery because they know they will have them in stock shortly after. It was hard to let a lot of them go. I figured 6 months later I'd be looking for the ones I gave up. But that hasn't happened even once, and it's been a couple years now. It was part of my Marie Kondo cleaning project, lol. I actually feel much more free and glad the books were able to be read by others rather than my hoarding them when I wasn't going to re-read them. 95% of the books I buy are on kindle now. @nakazcid Yeah, it's irritating when the publishers do that. But at the same time, think of what you are saving as far as shipment goes. What it takes to get a paperback to you via airplane in 1-2 days takes a huge amount of resources. To me, it's worth the $2-5 more to avoid the airplane ride, the plastic packaging, the cardboard, the truck to deliver it to my house and the manufacturing process that brings books into physical form. And that happens whether you buy it at a store or on amazon. Many libraries offer e-books now as well, and you can check them out right from websites. Even in the sticks here we have that option. I admit I have a rather splendid collection of books by the Folio Society on my shelves. I moved away from Kindle and started buying high end physical books instead. They're as much art as they are literature! Kindles are convenient for sure but nothing beats a real book. Same here! Can't beat a real book. I agree with all the sentimentality. I love hoarding books and having an overfull bookshelf. I'm part of a little McDonald's book club and it's been nice giving books to my coworkers. It's so stimulating. The place has been significantly down as of late. I buy too many books though. And I don't know what I'm going to do wanting to travel but lugging around a library. I will never stop buying books but I think it'll be nice to decide which ones not in print... maybe break a habit. And save trees! ... maybe break a habit. And save trees! Imagine what more useless waste of paper than toilet paper. We don't get them at all here unless you want to pay $1200 for your smart toilet, which has a remote and a nightlight . You can get some kind of attachable thing I think but it looks like a cereal box reward. I'm sure there are other choices with bidets but they are not easy to come by for sure, which is unfortunate. I hate dealing with toilet paper. It costs too much for what it is, and we have to buy special septic-safe TP so it's even more. In South America, as well as Spain, Austria and some parts of France, bidets are pretty common, and totally inexpensive. Not having a bidet in Argentina would be as weird as not having a wc. I regret so much not having added a bidet when we built our house in Switzerland, but here bidets are uncommon, and there was no space calculated for one in our bathrooms. I read somewhere that @federica is a moderator. You could probably try, but I wouldn't recommend flushing the kindle, and I doubt it does a satisfactory job! One other reason I like when a digital option is available - shipping time. I read an article in a paper the other day about a book written in Europe. Very excited about the book, but no kindle version, so I have to wait 6 weeks for it to arrive (and hope it does, as many things shipped media mail sometimes show up after months and sometimes not at all).